In 1975, Popular Electronics featured on its January cover a computer kit built for home enthusiasts, touted to cost at least $1,000 less than anything else. It was the Altair 8800. Its creator, Dr. Ed Roberts, died Thursday. 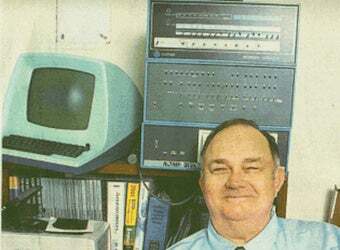 Roberts' creation is widely credited with kicking off the microcomputing boom of the latter quarter of the 20th century, and he is considered The Father of the PC. His computer kit sold thousands in its first month of availability, and so excited two young men that they hatched a scheme to write a programming language for it, called BASIC. Their names were Paul Allen and Bill Gates. Thursday, the Microsoft cofounders were among many industry giants paying their respects to Roberts. "Ed was willing to take a chance on us - two young guys interested in computers long before they were commonplace - and we have always been grateful to him," the two said in a joint statement. "The day our first untested software worked on his Altair was the start of a lot of great things. We will always have many fond memories of working with Ed." Roberts later had a falling out with Allen and Gates when the company created by the two, then called Micro-Soft, began selling versions of BASIC to Altair's competitors. Roberts' son said the three later patched up their differences, and Roberts remained an influence in both Allen and Gates' lives. Roberts later got his medical degree, becoming an internist. His son said Roberts remained interested in modern technology, and up until his death was asking about the Apple iPad. "He was interested to see one," said David Roberts. Dr. Henry Edward Roberts was a veteran of the U.S. Air Force, a 1968 graduate of Oklahoma State University, and a 1986 graduate of Mercer University's medical school. He died in a hospital Thursday after an extended battle against pneumonia. He is survived by his wife, mother, daughter, six sons - and millions of personal computing users and enthusiasts the world over.